DE = Germany ( 11 ), ES = Spain ( 12 ), FR = France ( 26 ), IE = Ireland ( 1 ), IT = Italy ( 4 ), NL = The Netherlands ( 1 ), PL = Poland ( 3 ), PT = Portugal ( 1 ), RU = Russia ( 5 ), SK = Slovakia (3 ), UK = United Kingdom ( 3 ). BLM, usually a Dutch observer, is registered as a French one. You will find in the table hereafter the list of the observers abbreviations in alphabetical order, with the number of observations made by each of them. Welcome to the new observers (in bold characters)! ELL : videorecording, was on predicted central track. Due to clouds, recording started only 30 sec after predicted appulse time. Both observers were in the predicted path: IVY 14 km north, ZHS: 24 km south from the centreline (max predicted duration: 6.7 s). OJR was nearly on the centre of the predicted track but his observation is significantly shorter than the max duration (5.3 s). Incertitude was great for this small asteroid (25 km). These two negative observations show the real path has been shifted, since both observers were in the predicted path. The lack of positive observation lets the position of the real path remaining unknown. Incertitude was great for this small asteroid (18 km in diameter). The BCL, BDR and RSG negative observations and the NNE positive one are consistent with a shift of the shadow path ~1.8 its width toward south, relative to S. PRESTON prediction. NNE was probably close to the real centreline since he registered an event with duration equal to the max predicted one (3.4 s). JLX observation is irreconcilable with the others (especially the RSG negative observation, shifted only 11.2 km laterally relative to the shadow motion) and thus remains unexplained. Note that this event occurred about 15 s later than the S. PRESTON predicted time. north. LZJ was just at the predicted southern border. PCI : CCD drift scan; incertitude was great for this small asteroid (18 km). Incertitude was great for this small asteroid (13 km). MBU was in the predicted track but incertitude was great for this small asteroid (22 km). DNZ : videorecording. This positive observation shows the prediction to be exact. Kempchinsky as it occurred at the predicted time for his location, so the shift must have been as great as 4 path widths. observation, letting the two firsts unexplained. to the max predicted one (9 s). (3709) Polypoites is a Trojan asteroid. RTH was in the predicted path. The real one has been shifted but the lack of positive lets its position remaining unknown. The positive observation shows the Pic du Midi was almost on the centreline. As the S. PRESTON's update put it upon the northern limit, the path must have been shifted toward north. This shift made CNS and MJL just miss the shadow by a few kilometres. IMV : CCD imaging, was at immediate vicinity of the predicted path. Incertitude was great for this small asteroid (13 km). JLX with J. MONTANNÉ, his sons and A. DORIVAUD. Unfortunately the main reappearance occurred during a 0.51 s technical interruption (for automatic file saving), or maybe just before it. So it results a large ±0.4 s uncertainty of the R1 time. Pic du Midi was just near one of the border of the predicted shadow path. DGG : videorecording; SPS : CCD drift scan, was just on the southern border of the predicted shadow path. CNS, PEC : videorecording. Incertitude was great for this small asteroid (13 km). The observations are consistent with a shift of the shadow path toward SE, by about one of its width, which puts RYF in the shadow but PEC out of it. CZA and EBA in double station, were in the predicted path. The set of negative observations shows the real path has been shifted by at least a third of its width, probably toward north, but the lack of positive one lets its position remaining unknown. DGG : videorecording ; an occultation may have been missed, due to clouds : survey started only at 21:07:05 for a predicted event at 21:06:30. NNE : CCD drift-scan, was at immediate proximity of the predicted path but incertitude was great for this small (15 km) asteroid. DEN, DGG, RTH : videorecording. These three observers (resp. JNK) were at immediate proximity of (resp. in) the predicted path, but incertitude was great for this small asteroid (18 km). with the diameter used for calculations. The positive observations show the prediction to be exact. JGS : videorecording, was out of the predicted path, close to its northern border. The positive result shows the real path has probably been slightly shifted toward north. 1999 XB 214 is a Trojan asteroid; DGG : videorecording; JLX : CCD imaging, survey disturbed by clouds. PEC : videorecording; JLX : CCD imaging, noticed a progressive disappearance : the measured star flux was only ~46 % of its normal level on the D-image (mid-exposure at 03:46:22.64), but normally jumped at the reappearance from zero (03:46:25.07) to the full luminosity (03:46:25.35). As the max predicted duration was 2.5 s, JLX was nearly on the real centreline. The shadow path has been significantly shifted, as he was about one path width toward north from the predicted border. Note that the trt first event occurred at the expected time so it corresponds with the predicted one. It has been almost central, since max predicted duration was 1.3 s. So, the real path has been shifted toward south by about half of its width. 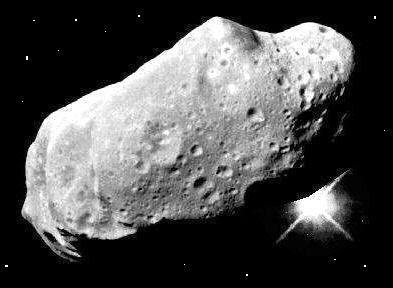 The secondary event in case of a double asteroid should correspond to a 25 km body, at a separation projected about 2700 km on the sky plane. SCE : CCD drift scan; duration must be good, but absolute timing may be in error by up to ±1.5 s.
TYC 1879-02151-1 has been identified with the double star COU 581, with components of Mv 10.4 (A) and 10.5 (B). Separation was extrapolated by JLX from the available measurements as 0.26” at PA = 241°, leading to the publication of a last minute prediction with two separate tracks. and PA = 240° relative to A, in perfect agreement with the extrapolated values and a direct measurement performed by JLX after the event at the Pic du Midi observatory. PRB observation doesn’t seem to be related to (519) Sylvania, since it has not been confirmed by SMD neither by SPS, the three observers being nearly on the same chord. The DGG positive observation shows the real path has been slightly shifted toward south-east. HSC observation is in perfect agreement with the prediction. IVY : double observation (CCD drift scan and visual), was at 6 km south the centreline, for a predicted path width of 74 km. His negative observation shows the real path to be shifted but the lack of positive observation lets its position remaining unknown. Reduction shows that DEN missed the event by a few kilometres. The three positive observations permit to draw nearly a half circular profile of (697) Galilea, in agreement with the mean diameter used for calculations (80 km). The observations show the real path has been shifted by about half of its width, toward south-east, relative to the prediction. RTH was in the predicted path. His negative observation shows the real path to be shifted but the lack of positive observation lets its position remaining unknown. SMD was far from the predicted path. Such a wide shift is not unlikely as the incertitude was great for this small asteroid (19 km). Nevertheless the observed duration is significantly greater than the maximum predicted one (2.1 s). It is necessary to send a report even if there has been no occultation from your place (negative observation). These negative observations can sometimes be of as great interest as positive ones : they can be decisive to determine the shape (“shepherd observations”), refine the orbit of the asteroid or discover un unknown satellite ! Please DON’T FORGET to use the IAU format YYMMDD for the date of your reports.